PEI Yi, ZHANG Xiaojing, ZHENG Ke, WANG Wei, QIU Enduo, LI Shenglong. Inhibitory Effect of miR-212 on the Malignant Biological Behavior of Osteosarcoma Cells[J]. Journal of China Medical University, 2018, 47(10): 924-928. Abstract: Objective To investigate the mechanism by which miR-212 inhibits the proliferation and migration of osteosarcoma cells. Methods MIRDB predicts the binding site of miR-212 and zinc finger protein-133 (ZNF133), and a luciferase reporter assay confirms their relationship. The effects of miR-212 on the proliferation or migration of MG63 cells were detected by MTT assay and Transwell assay. 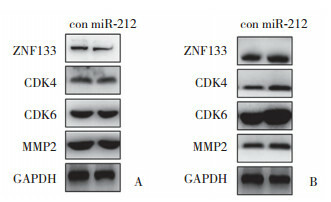 Western blotting was used to detect the effect of miR-212 on the ZNF133, CDK4/6, and MMP2 expressions. Results MIRDB predicted that miR-212 had a binding site for the ZNF133 3'UTR region. 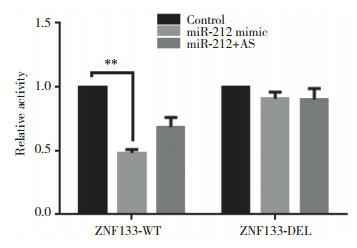 The luciferase reporter gene experiments showed that miR-212 can directly act on ZNF133. The MTT test showed that after transfection of miR-212, MG63 cell proliferation was significantly inhibited. 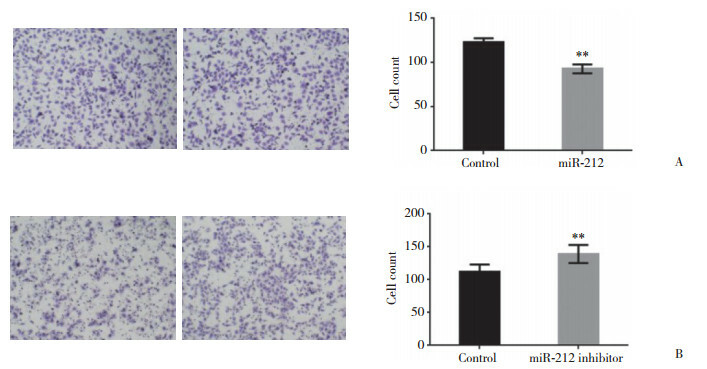 Transwell experiments showed that miR-212 could inhibit the migration ability of the osteosarcoma cell line MG63. Western blotting experiments proved that miR-212 inhibited the proliferation and migration of MG63 cells to some extent due to the miR-212-mediated inhibition of ZNF133, CDK4/6, and MMP2. Conclusion miR-212 can inhibit the proliferation and migration of osteosarcoma cells by inhibiting the ZNF133, CDK4/6, and MMP2 expressions.